When Rigan Machado was seventeen years old, he was taught an important lesson. The young Brazilian Jiu-Jitsu prodigy had earned himself a reputation as one of the most dangerous competitors in Brazil by winning a string of national tournaments in devastating fashion. He was undefeated on the competition mat and was quickly making his way through the ranks under the eye of his coach Carlos Gracie Jr.
As one of the five Machado brothers, and a cousin of the Gracie family, Jiu-Jitsu was in his blood, and any sign of arrogance by Rigan — or one of his siblings — was always quickly stamped out by the other family members. But on this occasion, Rigan’s ego had gotten the better of him, and his coach Carlos, as well as another of his training partners — future UFC legend Royce Gracie — decided it was time to teach him an important lesson. 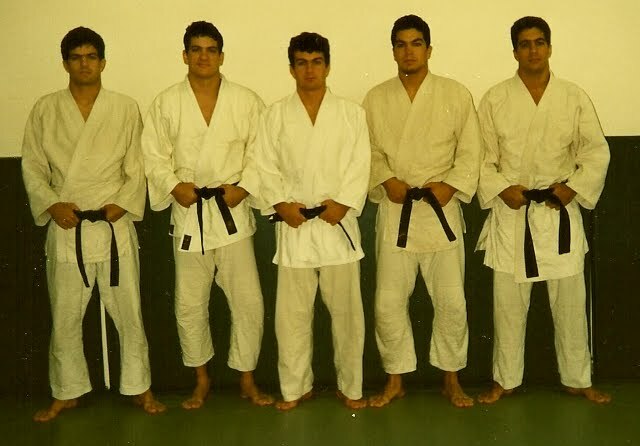 Rigan (Centre Right) with Rickson Gracie (Left) and Royce Gracie (Centre Left). This was a moment that would leave a lasting impression on Rigan's mindset and would shape his philosophy toward his Jiu-Jitsu and his life for years to come. The lesson achieved its intended outcome. From that eventful training session, Rigan's approach changed for good. He did go on to become the best in the world and a legend in BJJ, both as a champion competitor and teacher to some of the best practitioners in the world. Today he applies his incredible knowledge of Jiu-Jitsu as both a fight scene choreographer in some of Hollywood's biggest films, and as a teacher at his gym 'The Academy' in Beverly Hills — where celebrities like Ashton Kutcher, Mel Gibson and Demi Lovato have trained utilising Rigan's unique BJJ training system. But no matter where he goes or what celebrities he is with, Rigan is always aware of the important lesson in humility he learnt many years ago on the training mats. The Early YEARS of Machado Jiu-Jitsu. When you are one of five boys growing up in the heart of Brazil and a direct relation to the Gracie family, there is little room to decide what will occupy the majority of your spare time. For Rigan and his brothers Carlos, Roger, Jean-Jacques and John it was always Brazilian Jiu-Jitsu on their minds and in their hearts. In his youth, Rigan won the Brazilian Nationals every year and in every belt division between the ages of 14 and 21. In that time he set an amazing record of 365 wins and 0 losses, once competing in 19 matches in one day and finishing them all by submission. His long-time training partner, fellow Black Belt and close friend John Will remembers the first time he saw Rigan in competition. In the spare moments when Rigan and his brothers weren't training at their family home in Rio De Janeiro, their father would often take the boys out to the local movie theatre. Here they would sit together and watch Hollywood films starring Clint Eastwood, Al Pacino or Arnold Schwarzenegger, and it was in these moments, away from the gym, that Rigan’s mind began to dream and became captivated by a new obsession. Rigan’s father, a court judge, was an avid movie fan and he would talk to the boys about these films and his favourite actors for hours. It was these early memories that Rigan says led him to pursuing a career in the entertainment business. After travelling to the US to visit the Gracie’s in the late 80’s, and witnessing the success that they were having establishing their own Jiu-Jitsu academies, Rigan decided it was a great opportunity for him to also make the move over to America. Rigan moved to California where he was soon followed by his brothers Carlos and Jean Jaques. Then— with some help of fellow martial artist Chuck Norris — they set up their first school and began to teach BJJ. Chuck Norris with the Machado Brothers. Now, almost 30 years after moving to America, Rigan combines his two childhood passions —BJJ and movies — in a way he never thought possible. Rigan developed a training system for his actor clients that protects them from the major risks of getting hurt or injured through sparring. It’s a system he's worked on over a number of years to make sure his students are both technically proficient and physically conditioned despite significantly reducing the amount of sparring in their training. Watching Rigan teach his system at the Academy, it’s clear he watches his students incredibly closely. Stepping into their technique drills, he physically corrects small posture and positional movements as they occur to ensure that each technique is being learnt as efficiently as possible, minimising the potential risk of injury. It is his attention to these details that has seen Rigan become the go-to teacher in LA. Being close to his students both on and off the mat has also had a positive effect on Rigans life, admitting that he learns more from his students than they do from him. It’s these lessons that have also influenced Rigan to branch out into his own ventures, launching the Jiu-Jitsu World League (JJWL) in 2015 with the aim of creating a professional Jiu-Jitsu platform that appeals to larger commercial audiences. Rigan has also recently launched his own clothing brand, Phyve Supply, a streetwear brand with a focus on martial arts, surfing, climbing and skating. It’s a reflection of the philosophy and lifestyle he says he has learnt from living and breathing Brazilian Jiu-Jitsu. What makes a great legacy?